Cornelius Van Ness and his brother George Van Ness came to San Antonio in 1837 and 1838 respectively where they both practiced Law. Cornelius represented Bexar County four times in the congress of the republic, where he was a member of the committee on Indian affairs. He died in San Antonio on May 2, 1842. In 1841, George was appointed as a member of the commission to represent the Republic of Texas on the Texan Santa Fe Expedition to secure the Republic’s claims to parts of New Mexico. Among the men on the Texan Santa Fe Expedition were merchants that were promised transportation and protection of their merchandise during the expedition, as well as commissioners William G. Cooke, Richard F. Brenham, José Antonio Navarro, and George Van Ness. From the time of it founding in 1718, as a fort to protect the Mission San Antonio de Valero, until the time of The Republic of Texas, San Antonio struggled to survive while under Spanish and Mexican rule. In 1834, the population of San Antonio numbered only 2,400 or less than half of that of the previous quarter century. During the Texas Revolution, San Antonio was the site of several battles, including the Siege of Bexar and the Battle of the Alamo. While many of the men from San Antonio were away with Sam Houston’s army, many of their families fled and abandoned the city in an effort to escape Santa Anna’s army, joining the famous “Runaway Scrape.” The news of the Alamo's fall and the Goliad Massacre of James Fannin's men created a panic among Texas settlers who began to leave everything and make their way east towards safety. The flight continued until news came of General Santa Anna’s defeat at the battle of San Jacinto. After the defeat of Santa Ana’s army at San Jacinto, Juan Seguin was put in charge of a provisional government in San Antonio. On June 5, 1837, the city of Bexar was incorporated by the Texas Congress, and then on December 14, of the same year, it was reincorporated as the City of San Antonio. A failed attempt to negotiate the release of captives held by Comanche Indians resulted in yet another battle in the streets of the town, the Council House Fight of 1840. In the city's first municipal election in 1837, John W. Smith was named the first mayor of San Antonio under the Republic of Texas. Manuel Martínez, Francisco Bustillos, Gabriel Arreola, Rafael Herrera, Francisco Antonio Ruiz, Ramón Treviño, Pedro Morales, and Francisco Granado were elected to the city council. Likewise, José Eugenio Navarro was elected treasurer, Manuel Pérez secretary, and Vicente de la Garza collector. Philip Dimmitt a pioneer Texas trader and merchant and major figure in the Texas Revolution, was born in Kentucky, about 1801 and traveled to Texas about 1823 with a letter of introduction to Stephen F. Austin. He settled in La Villita at Bexar and for several years and was commissary contractor to the Mexican garrison there. He married María Luisa Lazo, whose father was a De León colonist and kinsman of Martín De León, and by marriage received a three-league headright in De León's colony. 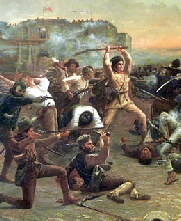 depicts Davy Crockett in a charge at the Mexican troops who have breached the walls of the mission.